At Under the Sun we are so fortunate to feature many local potters and ceramic artists, many of them featured below. Check back frequently for new additions! These whimsical shore birds are inspired by the sea, sand and surf here on Cape Cod. They are all made unique, with many different expressions. Anne Helpin is a local Woods Hole potter who creates timeless pieces of beauty and function. Her glazes reflect her love of nature and the ocean. Bob LaCava’s pottery is inspired by the sea and the creatures we share it with. He sculpts and hand paints each piece of clay in his Cape Cod studio. Sarah’s work has been inspired by her own back yard here on the Cape. As she carves images of plants and saline using the sgrafitto technique, the beauty of her colors and skills capture your attention. She creates bowls, mugs and various other beautiful pieces for your use and enjoyment. Vicki’s creative spirit and sculptural talent in clay creates whimsical sea creatures for any decor. From mermaids and seahorses to stingrays and octopus, they will charm you. Zoe Prior-Grosch has created the tentacle mug in wonderful glazes of aqua and orange. They are comfortable and easy to hold. 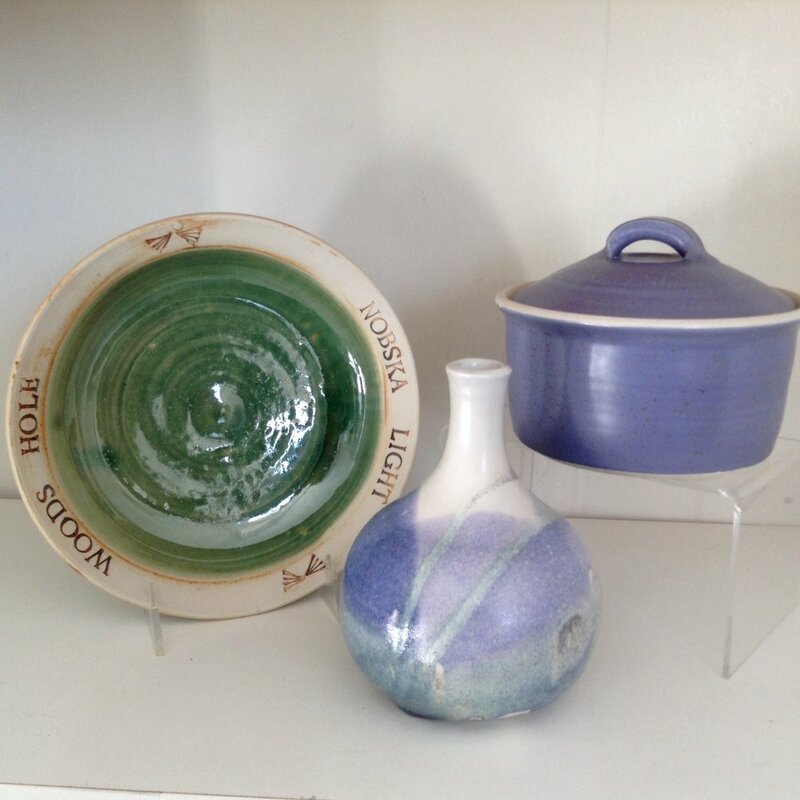 Chatham Pottery has been creating stoneware for three decades. Their designs for baking and serving ware are timeless. Their wall pieces of the Limulus bring pottery to life. Gary Wilson’s Wave Bowls are available in beautiful glazes of cobalt blues and tropical ocean colors. His designs are simple yet elegant and reflective of the rich marine life here on Cape Cod! They are food safe. Jan and Mike Sell create beautiful ocean inspired pottery from their studio in British Columbia. Their many pieces are elegant and useful. Rosalie and Tom Nadeau have been creating their ceramic fish platters, from their Cape Cod studio for many years. The platters, available in Striped Bass and several species of flounder, show a fabulous attention to detail. Artist Nancy Salamon creates beautiful, fancy fish for your wall decor. Her glaze colors are very muted and soft and will brighten any wall. Wonderful! Whimsical! Useful! These charming dishes always bring a smile to our customer’s faces. A unique gift to give or receive, these delightful dishes are made by Sukey in North Carolina.